Rudolf Juchter van Bergen Quast, blazon and blason. Rudolf Juchter van Bergen Quast, badge. This is an schema to draw and standard. I do not use a fixed geometry, but in this case, I draw a 1/2 ratio between hightest side h at the flagpole and the diameter d of the circle on the end (see the lines and text Gules in the schema). The lenght of the standard depends on the bearer range and the kingdom, there are tables, but I only use them under the bearer instrucctions. Be aware about how to split the motto, the 1st line on the left (from the observer point of view, the heraldic dexter) and the 2nd line on the right (from the observer point of view, the heraldic sinister). 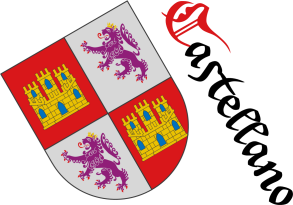 The coat of arms is near the flagpole and I use to make enough space for a shield with a 5/6 ratio between its base and its height (lines and text Vert in the schema). Classification: Flag, Personal and Schema. Sigue por: Neil Thompson, pointed shield and metal watercolor finish. Watercolor, Pointed, Armed, Ermine, Azure, Flag, Barbed, Bordure, Seeded, Head, Pean, Crown of prince, Bendy, Tusked, Outlined in sable, Two, Dragon, Chinese dragon, Elephant, In bend sinister, Coat of arms, Male figure, Personal, Gules, Illuminated, Badge, Interpreted, Chief, Juchter van Bergen Quast, Rudolf, Langued, Motto (motivation), Leopard, Hand, Mantle, Wavy, Ordered, Or, Oval, Pale, Statant, Pasant, Quill, Rose, Sable, Sinister, Vert, Thompson, Neil, Spot ink and Freehand.